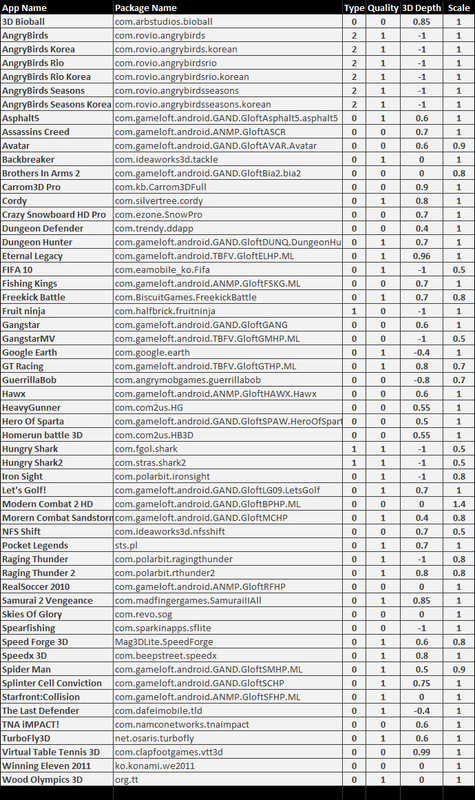 The image above shows the full list of 56 applications (55 games plus Google Earth) that have profiles for the 3D Game Converter software for LG Optimus 3D and LG Thrill 4G smartphones. You can see not only the name of the games, but also their identifiers that are used for autodetection, as well as the settings that LG has provided for them for best best experience in stereo 3D mode when they are converted by the 3D Game Converter software. You can use these settings as a reference to help you get better idea on how to use the custom settings for the free versions of these applications, that won’t be automatically recognized by the software, as well as for applications that do not yet have official profiles. And while the numeric values may be of some help it is still a bit of a problem to get the same settings applied as you only have sliders with no numeric value being shown when you are making custom profiles for applications in the 3D Game Converter software.